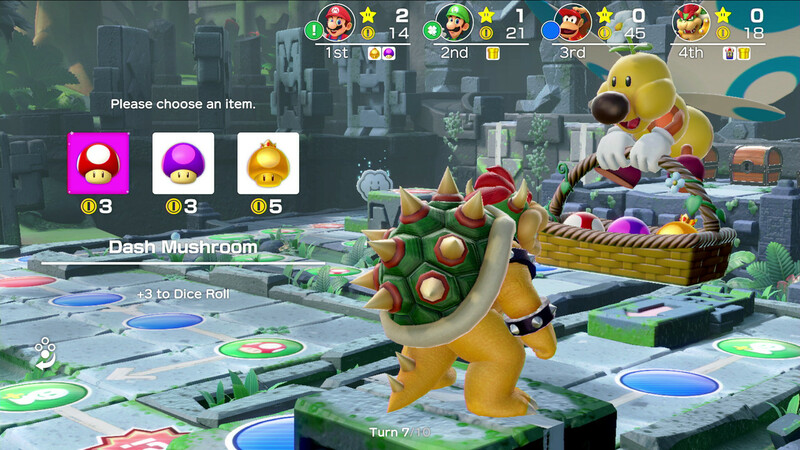 Dan rolls the dice with Super Mario Party on Switch. 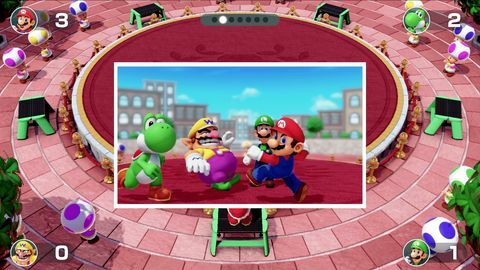 Super Mario Party is for the most part a welcome return to what made the original series so great, and is some of the most fun I've had with friends on the Switch since launch. Packed with several different modes and 80 mini-games for one to four players, it's a wonderful way to spend a few hours with friends and family. 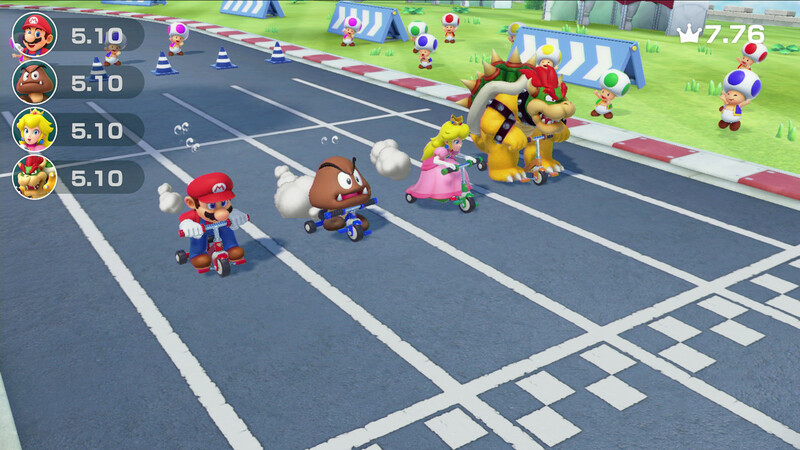 I can see myself taking Super Mario Party along to all of our gatherings in the coming months. One thing I have to get out of the way before we get into it is the control options for Super Mario Party. You wont be playing this one in handheld or with your Pro Controller. The only way to play is for each player to use a single Joy-Con, which makes sense, but may disappoint some. 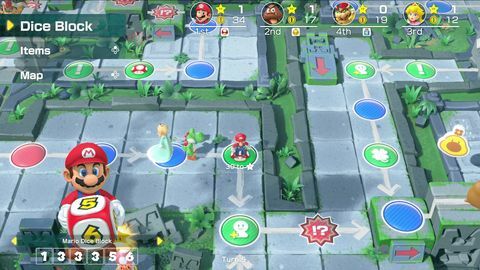 It's still possible to play with the Switch in table top mode, although with four players, things can get a little on the hectic side. For the best experience, you'll want to plug your Switch into the TV. Now that that's out of the way, let's jump right in! The tried and true board-game mode is back once again and sees four players making their way through each board and nudging out the competition to obtain the most stars. While this mode is fun, the lack of memorable boards make things start to feel a bit stale much sooner than I would have liked. With only four boards, and limited paths through them, it's likely you'll see everything this mode has to offer in a matter of hours. The main mode sees one to four players rolling dice to move around the branching paths of the board game inspired levels. Players are able to recruit allies which will add bonuses to your dice roll. These allies will join you in some of the minigames but the AI leaves a lot to be desired and they can't hold a candle to a real player. 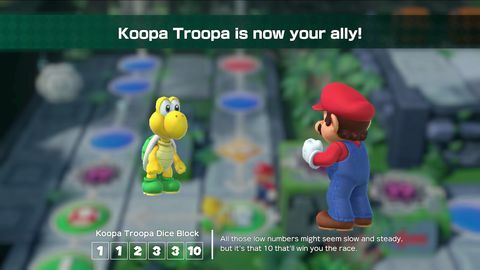 On top of this, each ally gives you a unique dice which has different sides depending on the character. Mario's dice for instance, gives you more 3's than any other number ( the numbers on it are 1, 3, 3, 3, 5 and 6). Each allies dice is different and adds a much needed layer of strategy to the game. Do you go for the more risky dice with a few high numbers and some negative sides or the one with a healthy amount of low numbers and little risk? The choice is entirely yours. I was excited to see what Nintendo would do with the power of the Switch but all four of the boards feel a bit uninspired and on the small side. While this is certainly disappointing, the mode is still great fun with a group of four players all actively trying to one-up each other. The boards my be forgettable, but the frantic fun had will have you and your friends laughing for hours. Combined with a few cheeky drinks, I can see myself taking Super Mario Party along to all of our gatherings in the coming months. As the star of the show, the mini-games truly make up for the any short-falls by offering a huge variety of activities which will have you playing with and against your friends to earn the most coins. I was pleasantly surprised by the quality of the majority these minigames. The best of the bunch are just so much fun that you'll quickly forget about the weaker ones. A lot of the mini-games utilise the motion features of the Joy-Cons to great effect. I've listed some of my favourites below. Whether you're wanting to play with your kids or your more "grown-up" friends, it's just so much fun regardless of age. Trike Harder - This minigame sees players mimicking the motion of pedaling a bicycle but using a hand on each end of the Joy-Con. Sizzling Steaks - This is hands-down the best looking minigame of the bunch. Just tell me that doesn't look like the nicest piece of steak you've ever seen. This one simply has you making a tossing motion with the Joy-Con to flip a piece of steak in the pan in a race to cook all of your sides first. Candy Shakedown - This minigame uses the Joy-Con rumble to wonderful effect. It really feels like you're trying to shake candy out of a jar. Players move the Joy-Con around trying to get the oddly shaped candies out of the jar the fastest. Off The Chain - This one pits one player against three. 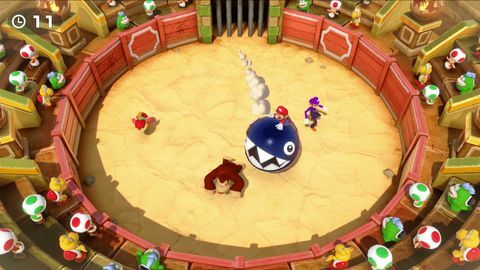 The solo player rides on top of a Chain Chomp, with the objective of chomping your opponents. The team on the ground has to try and survive for thirty seconds without being hit, which is a lot harder than it sounds when the Chain Chomp is in the hands of a seasoned Mario player. 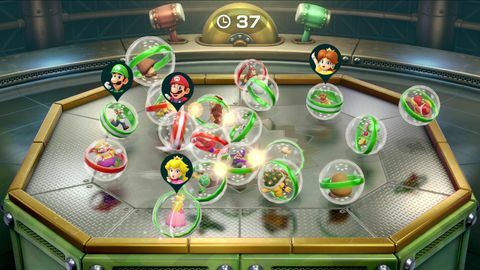 I've only listed a handful of the eighty minigames on offer, mainly because stumbling upon a new favourite game is a big part of the joy I found in Super Mario Party. I'd much rather let the rest be a surprise to those that read this and decide to give the game a go. The game also features an enjoyable if limited River Survival mode. The rafting was an absolute blast to play and had us all manically steering with a rowing motion and shouting conflicting directions at each other in a mad dash effort to make our way down a danger-filled branching river before our time ran out. There are balloons scattered along the river that you have to pop which will see you and your companions rushing to beat a 4 player co-op minigame to add precious extra seconds to the dwindling timer. It's unfortunate that there are only really ten co-op minigames, so you'll definitely start to see repeats quite soon into the journey. This mode was great fun initially but after a few sessions but, having seen everything it has to offer it left me wishing for just a bit more variety to help keep it from feeling stale too soon. The Sound Stage mode puts the group on stage to compete in rhythm-based minigames with a crowd cheering on. These range form swinging a bat at oncoming baseballs, to pumping your arm in the air like a marching band leader, all to the beat of catchy Mario jingles. Each session only goes for about ten minutes, so it's a perfect mode to play when you're stretched for time. This mode was wildly popular with my particular group of friends. Some of the mildly questionable actions these games had us doing had us in hysterics. We still have a lot of growing up to do clearly. The amount of laughter me and my group of thirty-something year old friends had is testament to just how well designed these minigames are. Whether you're wanting to play with your kids or your more "grown-up" friends, it's just so much fun regardless of age. While the game definitley has it's share of shortcomings, the quality of the good far outshines these issues and makes the game a must have for Mario fans. 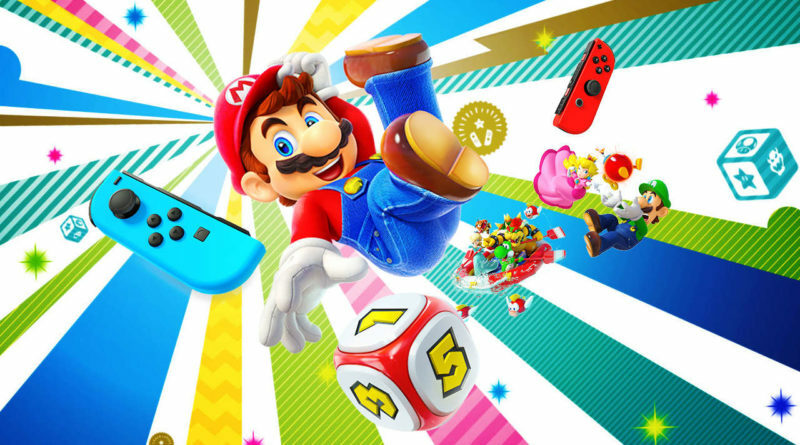 Despite the cost involved with needing to buy extra Joy-Cons, I can't recommend Super Mario Party highly enough to fans of the series and those looking for a great casual game to play with friends and family. Ups Huge selection of minigames. Perfect for players of all ages. Beautifully polished sound and graphics. Downs Limited control options. Board Game mode levels are uninspired. Some of the modes feel tired too fast.